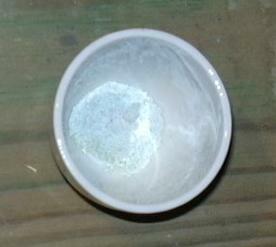 Add some copper(II) sulfate, pentahydrate to crucible. 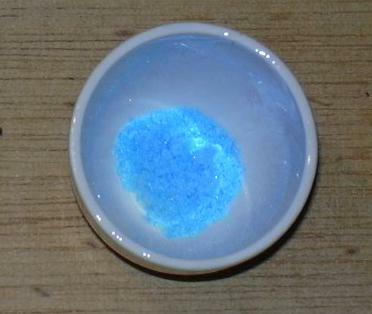 Heat the crucible with the burner until the blue color becomes a rather uniform, almost white color. This is more difficult to achieve in a test tube, as there it is more difficult to drive out the water of crystallization. Do not continue heating unnecessarily as otherwise the sulfate will decompose (brownish color). Let the crucible cool off (place on an appropriate surface!) until it can be held in one's hand (patience, check carefully!). Add drops of water until the original blue color has been restored (it is under dampness even more intensive). 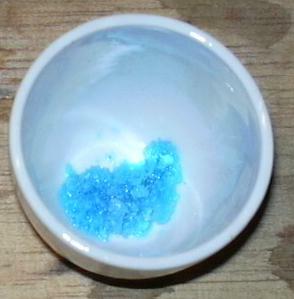 The copper sulfate is to be disposed of as heavy metal waste or kept for further experiments. Many (mineral-)salts form rather instable hydrates, out of which the water of crystallization can be driven out by heating. In the case of copper(II) sulfate this is, due to the different coloring of the hydrates, especially beautiful to observe.